Most dental implant treatments are similar, but rarely are two treatments exactly alike. With advances in technology, there are a number of dental implant materials on the market for patients to choose from. Not to mention, different dental implant providers use different kinds of materials, depending on cost and the provider’s preferences. Most dental implants are made out of titanium, serving as the foundation for the new tooth and replacing the tooth’s root. The quality of the material will directly affect the quality of the treatment, since dental implants procedures depend on jawbone and dental implant’s ability to fuse to one another. When it comes to choosing a dental implant provider, it’s a good idea to inquire about the types of dental implants they offer, ensuring they use the highest quality dental implant technology. 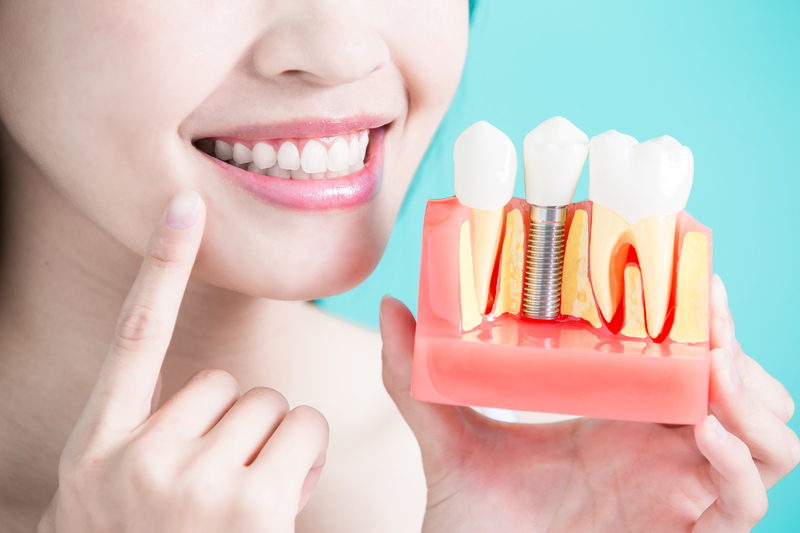 Today, our Brigham City dental implant practice will explain the different types of implants, so you can make educated decisions about your dental health. Dental implants come in a variety of widths and heights, depending on the teeth you need replaced and the anatomy of your jawbone. A common type of dental implant is the “mini” dental implant, which is often used for patients who don’t want invasive surgery, or don’t have the adequate bone health to receive a wider dental implant. Endosteal implants: Endosteal implants are the most common type of two-stage dental implant. They are typically shaped like small screws, cylinders, or plates that are inserted directly into the jawbone. Subperiosteal implants: These dental implants are less common, as they are only placed under the gumline, and not into the jawbone. These types of implants are used for patients who have shallow jawbones, or those who cannot undergo a more invasive procedure for various health reasons. Two-stage dental implants: Two-stage dental implant procedures often use endosteal implants. During these treatments, we place the implant directly in the jawbone, then close the surrounding gum tissue with stitches. After allowing the implant site to heal for several months, we will go back to attach an abutment, then the temporary crown. One-stage dental implants: One-stage dental implant treatments place a longer implant into the jaw, allowing the end of the implant to be seen through the top level of the gum tissue. The surrounding gum tissue is then stitched up around the implant, leaving the implant head visible above the surface. After healing for a few months, the abutment and restoration are attached without undergoing minor surgery to unearth the implant head. After the dental implant and abutment have healed in the gumline and jawbone, we will need to attach a permanent crown to the dental implant. Dental crowns can be created out of a variety of materials, typically from a porcelain variety. Zirconium. Zirconium is a material used to create a sturdy porcelain crown. Zirconium is often used in dental implant supported bridges, especially for anterior bridges, along with implant abutments. Zirconium crowns have a natural opacity, making the tooth look natural and white. They are also created using a two-layer system, making the finished implant sturdy and attractive. Cerec restorations. Cerec is becoming one of the most common and cost-effective materials used to create a crown. Cerec restorations can be created directly in the dental office using CAD-cam technology, cutting out the need for extra costs with a lab technician. Unlike Zirconium, cerec restorations are mono-colored, then customized to the color of your choice using surface staining. However, surface staining can wear off over time and make the restoration appear unnatural. For the most part, the strength and aesthetic benefits of your porcelain crown will depend on the cosmetic dentist who is creating the crown. With that said, many cosmetic dentists will use different porcelain crown materials, depending on your goals and dental health. An experienced cosmetic dentist will be able to produce a beautiful, natural-looking, and long-lasting crown for your tailored to your dental health situation. Want to learn more about the types of materials that we use for dental implants and crowns at Haws Family Dentistry? Call us today at 435-919-5100.